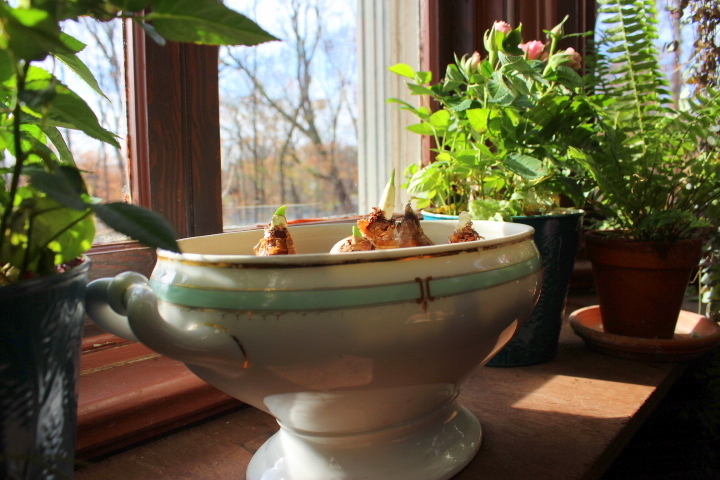 Yesterday, because I insist on having fragrant blooms in time for the December holidays, I grabbed my old soup tureen, several jardinieres, and some tacky whimsical Santa mugs, and planted them with tropical narcissus bulbs. Would you like to see the fun procedure? Note: If you want your tropical bulbs to bloom in time for Christmas, be sure to plant them by mid-November. December plantings will bloom just when you want them to: during a snowstorm in January. Unlike hyaincths, tulips, and other cold-hardy “Dutch” bulbs, tropical narcissi do not require a lengthy chilling period in order to bloom. Nor do they require soil, unless you are planning to save them for future planting outdoors. 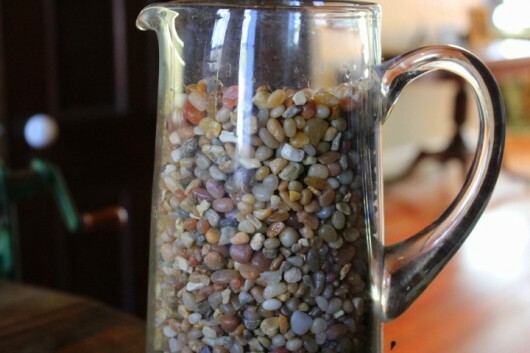 For indoor bloom, a simple medium of pebbles will do the trick. Tropical narcissi will grow in any water-tight container. The only rule is that containers be deep enough, preferably 4-5 inches, to permit enough pebbles to be spread under and around the bulbs, and thus give support to the big root masses which develop. And some Santa Claus mugs. Although the mugs are intended for hot beverages, their true calling is horticultural. 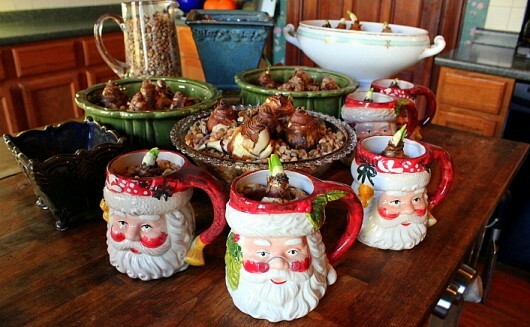 Planted with paperwhites (one bulb per mug), and arranged in a row on the dining table, the mugs make a nifty centerpiece for the Christmas buffet. Tips for Planting. 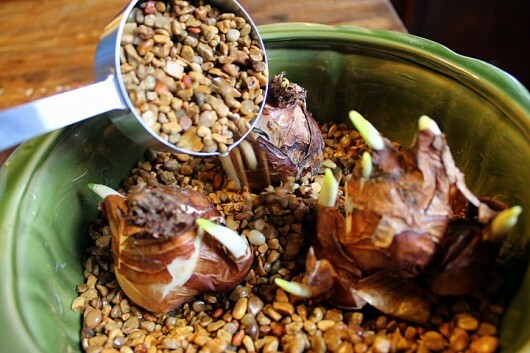 You’ll need pebbles or some other aggregate to anchor the bulbs in place. I prefer aquarium gravel, because it is composed of tiny, polished pebbles. Unlike driveway gravel or marbles, which are only suitable for large containers, aquarium gravel works in all planting-situations. The pebbles aren’t cheap, but they can be reused year after year. Confession Time: If I was a narcissus bulb, I’d want to be planted in aquarium gravel. First, fill your container half-way with pebbles. Then add only enough water to reach the top of the pebbles. 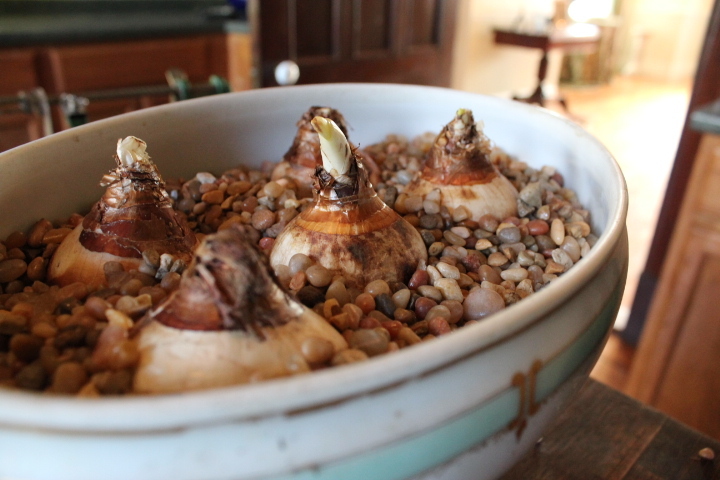 Now arrange the bulbs on their gravel bed. Never twist or push bulbs into gravel, as this might damage the basal plate. The basal plate is the flat bottom of a bulb, from which roots emerge. Odd groupings of three, five, or seven bulbs make the most attractive displays. 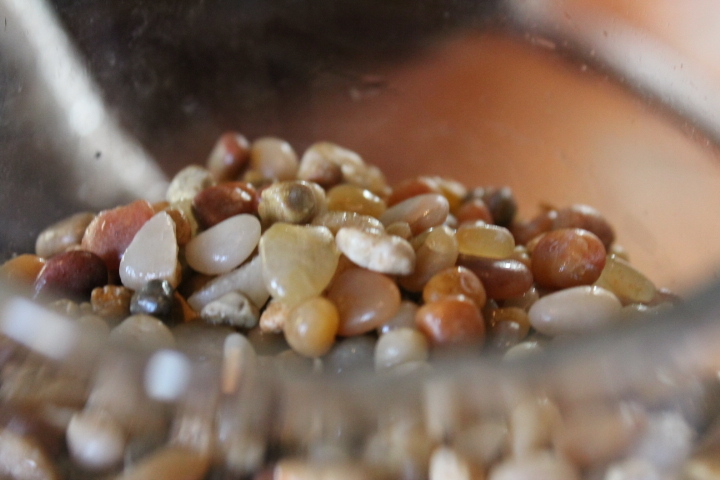 Sprinkle more pebbles betwixt and between the bulbs, just to anchor them in place. Bring the container(s) to a sunny window in a cool room (65°F max). I put my soup tureen in the south-facing window in the music room. There, the bulbs can share gossip freely with ferns and geraniums. Yes, houseplants are major gossips. I can only imagine what they say about me when my back is turned. To keep the stems from growing too tall (unstaked, they will collapse in a miserable heap just as the flowers open), give them a stiff drink: Let the roots grow for one week, then pour the water off, and replace it with seven parts water to one part gin (or vodka or tequilla — any liquor that is 40-percent alcohol will do the trick). The cocktail method really works. The plants will grow to half their normal size, but flowers will remain just as large and fragrant as usual. 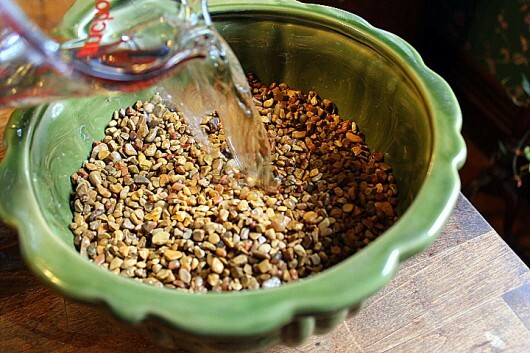 As evaporation occurs, replenish with the same liquor-mixture mentioned above, to a level that just tickles the base of the bulbs. Narcissus ‘Winter Sun.’ This great beauty offers white flowers, a bright yellow cup, and a sweet — not musky — perfume. Narcissus ‘Grand Soleil d’Or.’ This one offers a fruity fragrance. Its bright orange cup is surrounded by sunshine-yellow petals. Narcissus ‘Inball.’ My favorite of the all-white variety. It boasts more blossoms per stem than any other paperwhite. The scent is delicate. Well. 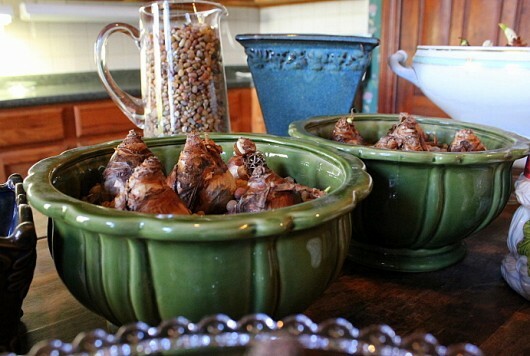 I hope I’ve inspired you to plant some tropical narcissi for winter bloom. The fragrant flowers will remind you that spring is merely a state a mind. 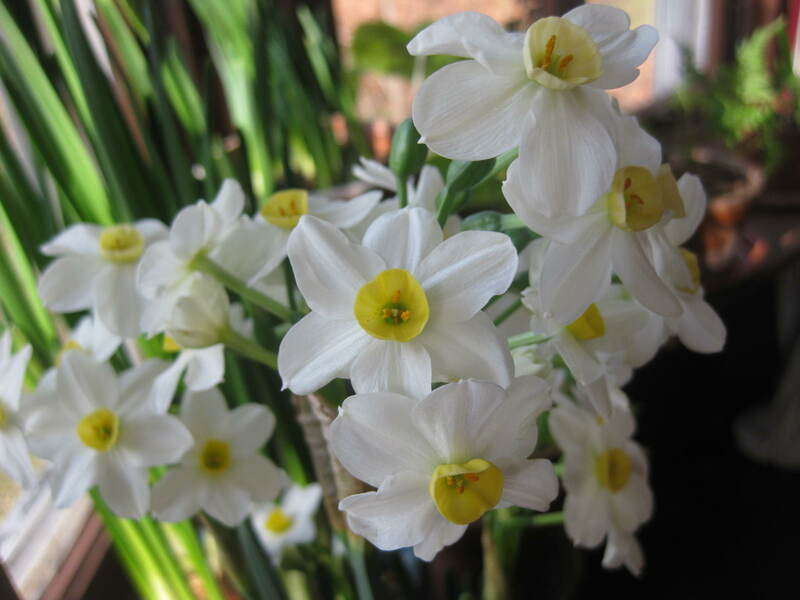 I remember growing narcissi in the house one year and they smelled so bad I had to put them outside. I remember them being musky and pungent. Are there REALLY kinds that do not smell strong/bad? Now I know just what to do with my shiny ceramic Santa Boot. Your photos are so informative, thanks for your tireless efforts to share garden secrets with us. P.S. 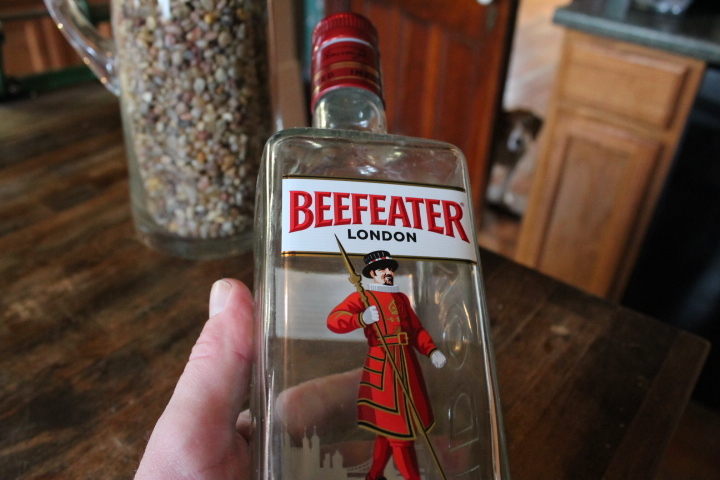 I see Lily peeking in at the gin bottle. 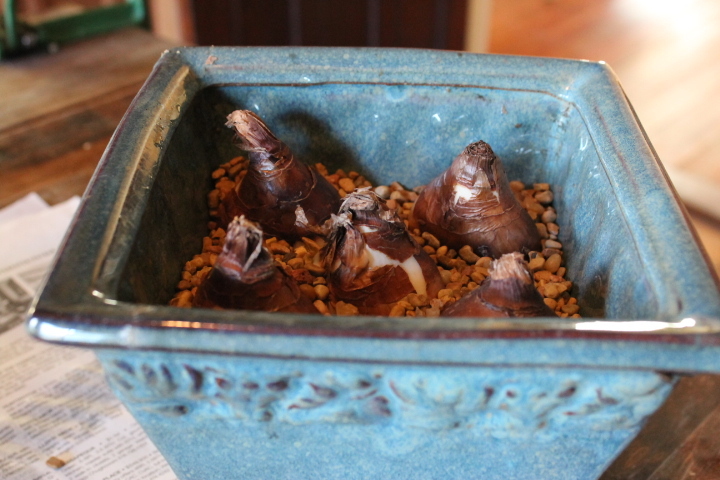 Hi Denise T – ‘Ziva’ paperwhites — the kind that most big-box garden centers sell — do indeed have a musky odor. But other varieties (including ‘Chinese Sacred Lily, ‘ ‘Winter Sun,’ and ‘Grand Soleil d’Or’) are blessed with sweet, subtle scents. Try ’em! Hi Beverly – Lily is a lush. 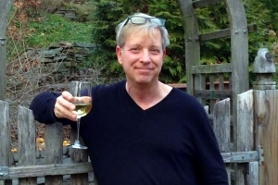 Hi Sandy M – Ditto! Hi Mary – According to the research folks at Cornell, alcohol causes the plant to take up less water, thus reducing stem and leaf growth, but not flower size. I am on the search for bulbs, can’t wait to try the “cocktail” method. Thanks for every thing you do. How do you pour the water out without dumping the bulbs and gravel? Oh, Kevin! I so look forward to my Sunday morning time with you! haha…do spare a bit of the vodka for our Bloody Mary’s, eh? LOVE the articles, the strolls, and occasional bit of gossip with your ferns. You ARE right…they are incorrigible and quite a delight! See you next week! Hugs! 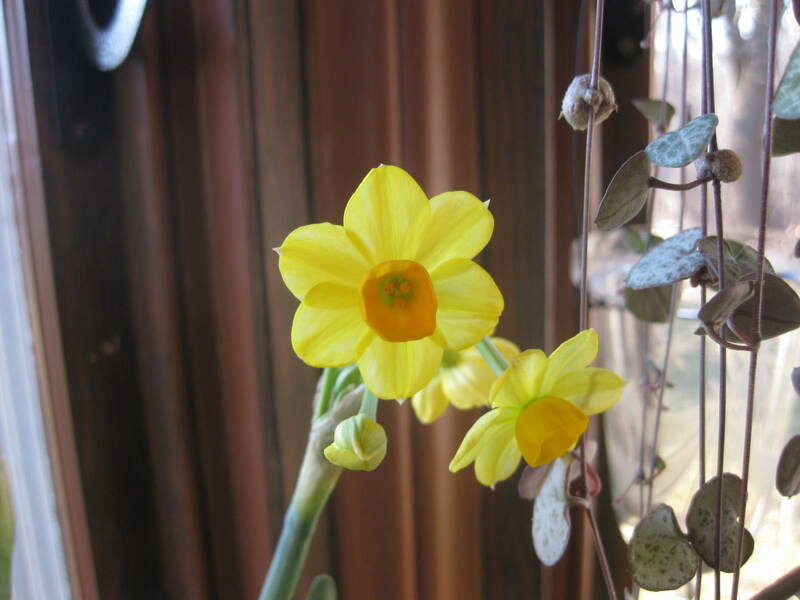 Can the narcissus plant grow indoors without using booze ? Would they still grow with only the pebbles and water ? I’ve never tried growing narcissus. This looks like a fun and easy plant to grow. I like your clever uses of non traditional containers to hold the plants, Kevin. Thanks for the fresh ideas. OH, OH! yes! Lily does seem to be ready for a refresh! I never grew narcissi before to have blooms for Christmas. For some reason it seemed too complicated or time consuming. BUT, after reading your instructions (and looking at your wonderful pictures) I will do it this year. Today, as a matter of fact, since it’s November 15! Thank you! Give Lily a kiss for me. Thank you, Kevin. You are so dear to so many of us. And may peace reign over the madness. RIP to all those who lost their lives in Paris on Friday. Thank you for the boozy tip! I’ve always grown narcissi in clear, tall containers because they always fall over just as their beautiful blooms and gorgeous scent are at peak. Since it’s 11/15, I am running over to our local nursery to buy some bulbs after I type this. Again, thank you, Kevin. LOVE reading your column. Where do I find tropical bulbs now? Hi Kevin. 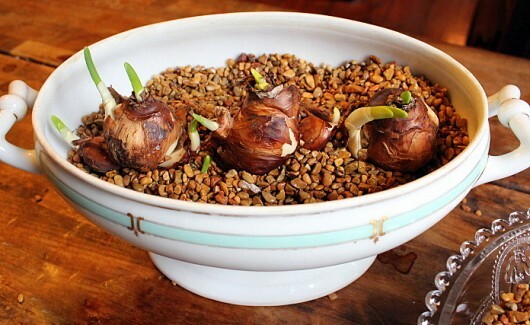 If I use the alcohol method, would I be able to replant the bulbs outdoors for next year? Also, where did you purchase your bulbs? I would love to try this because like everyone else, mine always fall over…also stink. So I gave up. Your cocktail method sounds awesome but don’t know if I can find the right bulbs in our small town. There’s always next year…. Kevin, where did you get the Santa mugs??? 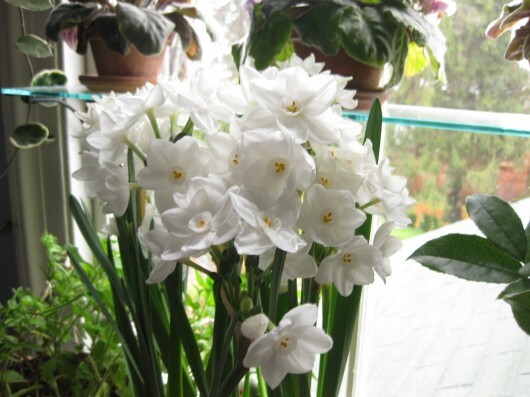 Hi Marilyn – I ordered the special narcissus varieties listed above from http://www.easytogrowbulbs.com. But most garden centers offer common paperwhites (tropical narcissus) in November-December. Hi Barbara – From what I’ve read, even without the addition of alcohol, water-forced bulbs are not suitable for future planting outdoors. And even then, since they are tropical bulbs, they would not survive in my cold-climate garden. 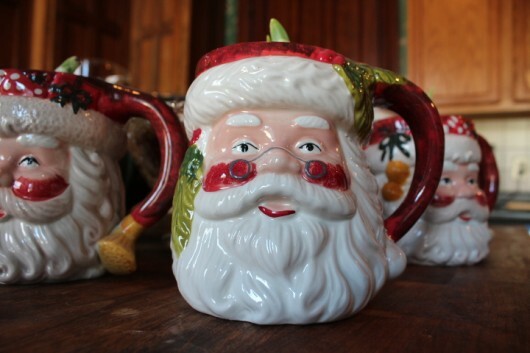 Hi Catherine – I purchased the 16-oz Santa mugs many years ago from a “Christmas Tree Shop” in Albany, NY. Love the paper whites – so lovely. However the fragrance is overwhelming for me and a few others that frequently visit – so, I no longer plant them indoors – know any fragrant free varieties? I do, however, plant about 12 amaryllis which I have nurtured from 2-3 original bulbs. I plant them in my garden over summer and feed them well so have huge blooms and lots of baby bulbs that take 2-3 years to mature. As for giving my plants MY gin – never. I can sip as I watch them grow but sharing only goes so far – with human friends 🙂 Now, have to get going with the 2 Thanksgiving ‘bashes’ I have planned. I think I’m going straight to Value Village to look for Santa mugs. Great idea for what I always considered tacky ceramics! Great information, Kevin. Thanks! The timing won’t work out for me to do this for Christmas, but my mid-January birthday will have some beautiful bloomers to help me celebrate. Wonderful! Thank you for finally answering why when I was a young child and grew narcissus as gifts for all the special adults in my life-they stunk so bad when they bloomed everyone threw them outdoors. I thought I was doing such a wonderful gift idea and people loved them till they bloomed. For years I heard about that, mostly my mother reminded me of it every Christmas until she passed away 17 years ago. I never tried to grow them again. I couldn’t understand why I would read about people growing them for gifts. Tomorrow I will try to find some of the “not” pungent type to grow this year. And thank you for the wonderful tip on how to prevent them falling over when they bloom. Could you please tell us how you dump the water out of these large containers without the bulbs and pebbles spilling out everywhere? I’m thinking that it would almost be necessary for another person to help OR you can’t possibly get all the water out. Thank you. I just love your site. I just returned from a trip to the variety store with a package of three narcissus bulbs called Ziva. The photo on the front looks exactly like your Inball. They are planted in a Roseville container and look very happy in there. So, we will see. Next Sunday I will give them a cocktail. I love doing things like this no matter the outcome. Honestly, Kevin! I swear I learn something new every time I read your posts. I had given up on narsissus because they always flop over and look ratty. Never again! Thanks! Brrrr! No room in my home is 65! Is a 78 temp too warm for this type of bulb? Cute post but now I’m kicking myself in the bum for sending all those goofy Santa mugs to the 2nd hand shop! Thanks Kevin! I ordered 10 of the winter sun paper whites and a half and half amaryllis from easy to grow. Yippee!! 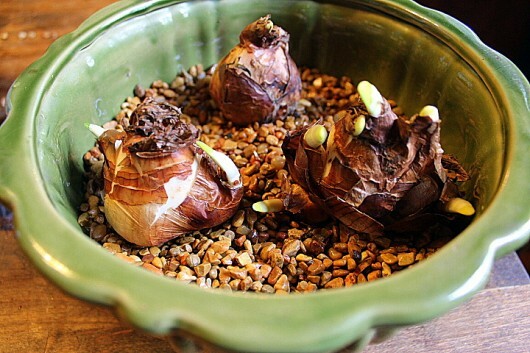 What fun ideas for containers for bulbs. I like the Santa idea for a table centerpiece. You have been busy! Thanks for spurring us ever onward to finer living. That soup tureen is too pretty to be planting anything in. BTW, made your butternut Squash pasta sauce(YUMMY), and used the leftovers as a soup by thinning it out with more vegetable broth(Even more yummy!) Sautéing the fresh sage and rosemary with the onions brought their flavor Over the top. Well done! I’ve purchased my bulbs at Home Depot, grocery stores, etc. I’ve never been offended by their pungent aroma. Maybe my smeller doesn’t work right! I’ve not tried the alcohol mixture, but I’ll share my Tito’s with them. Thanks for the helpful tips. My order should arrive tomorrow. I had to come back here to admire and refresh my memory on your methods. This will be a fun project. Thanks! I just found the bulbs at an antique store. Planted them as instructed. This is a first for me. How fun. My stones came and they are too big I fear. Not small like aquarium gravel but more like stones. Do you think they will still work? My paperwhite are currently getting drunk thanks to your recommendation… lol. Looking forward to non-flopping specimens this year! I’ve also filled my planters with winter greens & decorations and am hunkered down just waiting for some snow here in MA. Hope you had a lovely Thanksgiving! 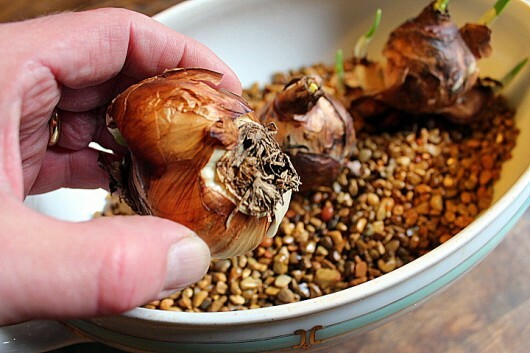 Kevin, I am just now in Feb. reading this post since I had some jonquil bulbs lying around and decided to see if I could plant them in a pot with soil and get them to bloom. I don’t know if I’ve done it correctly or not. I buried them in dirt–not very deep–and watered them and will set them in the brightest window in my house. Sadly, it faces east, but as we move toward Spring, the sun will get more and more bright. Hopefully they will bloom. I would love it if they did in March for my birthday. What kind of chance do you think I have? Also, Kevin, I noticed that several folks from this post asked how you pour the water out of the bulbs without pouring out the gravel and bulbs too? But I also noticed that you did not answer that question. Is that part a secret? Or …..? Please advise! Just think how many of us may have had to replant the bulbs before we even got to the gin! Love your blog! Thanks for all the fabulous information. Seems like you could use a turkey baster to draw the liquid out so as not to make a mess of the pebbles and disturb the bulbs. Thank you very, very much, Kevin! I JUST bought two bags of pure white narcissus bulbs and was looking for the trick you published in 2015 – and here it is again, so timely! Kevin, Your emails make my day special. Thank you!! Love these tips and especially adding the alcohol! Planting in individual cups is also a great idea for creating centerpieces or just a long row of flowers down the middle of the table. Thanks Kevin! I love your blog and all your great tips, recipes and ideas! years, now I have a use for them and a lovely memory of my mother. This post is amazing! I noticed that the bulbs in the photos have little shoots. Do my bulbs have to have shoots? Refreshing idea. Thank you for educating me about the Ziva bulbs, so I will keep my eyes open for the tropical ones. Love the yellow sunny centers! My soup tureen is awaiting! In addition to the tips people are seeking on how to pour the water out without making a mess, could you also speak to the cleanup after it’s all done? 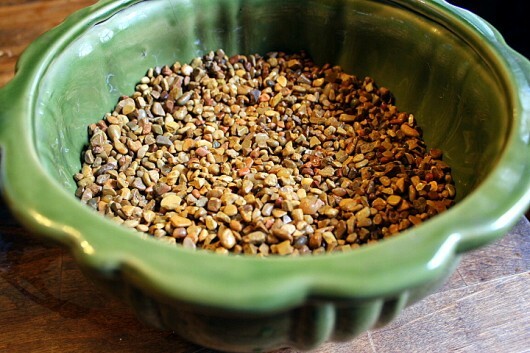 Both containers and pebbles… does using alcohol inhibit growth of algae? I have been following your blog for some time and now I must thank you for this fabulous article. I gave up planting narcissus (they were Ziva) when my housekeeper almost refused to enter my house because they smelled like “cat pee.” Now I’m so happy to find out there are other varieties! I’m planting hyacinth to force today, but hope to get some of the narcissus varieties you suggest. 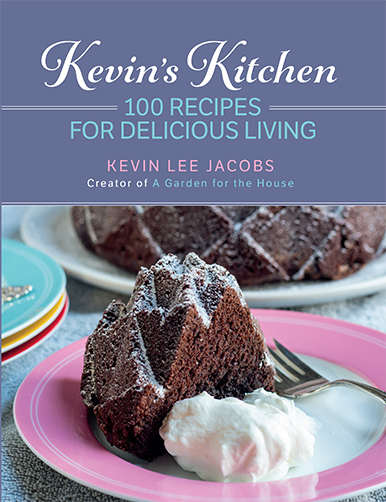 Thanks for your blog, I love your recipes as well…I am a fan! I was wondering what sort of clever staking you were going to use, but BOOZE is sheer BRILLIANCE! I hate the staking. I am going to run out and buy some bulbs, today! Does the liquor treatment work on amaryllis, too, I wonder? Kevin, thanks for solution to growing narcissus inside –can’t wait to try it. I love their delightful fragrance; thanks for naming best varieties!! BTW, for the first time ever, I “brined” a fresh turkey using, as you’d suggested, satsuma peels, sugar, sea salt, so forth in water. I oiled the turkey and parchment over breast, timed cooking perfectly — when I began to “carve’ turkey with a knife, it was so tender, it began to literally fall off the bone, so I just “lifted” my turkey “slices” onto a plate –so juicy, no knife required. It was not salty tasting at all; however, the drippings were, as you’d said, too salty for gravy, so used your idea of cooking giblets for the gravy. After 50 yrs of cooking dry turkeys, FINALLY, my family was IMPRESSED!! 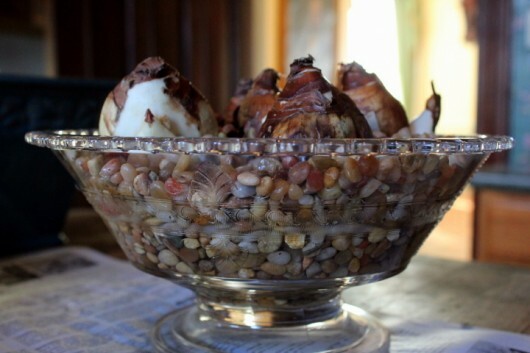 Of course, I just forwarded your inspiring and delightful Blog to all asking for recipe!! Looking forward to more gardening ideas and recipes, as always! Now thst you’ve removed my 2 obstacles to forcing bulbs, I will once again look forward to flowers in winter. i can suggest a method for draining the bulbs. Try holding a coffee filter over the bulbs and stones to drain it…Or… do whatever Kevin is going g to say….I know he will. 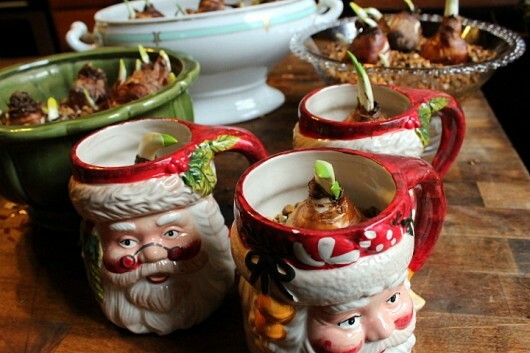 Now I know what to do with my Santa Mugs . Thanks for the ideas! Had to order the sweet smelling Paperwhites that you suggested. I can’t wait to smell the different varieties. Thanks so much for your advice. Now to find some unique planters and polished gravel. I used your alcohol (hicup!) trick last year and it worked like a charm. get rid of things”) mugs. Thank you for all your great ideas. Gin? Who’d thunk? However, like some of your other friends here, I’m waiting for your suggestion on how to remove the water without making a mess of the whole thing. KEVIN, Another clever and creative idea! But how do you pour the water out to add the gin/water mixture? Hi Kevin- I wanted to say that I tried this and it really worked! Foliage wasn’t flopping al over and flowers were beautiful. Thanks for the tip! Wonder if it would work with amaryllis?? ?